Our dear friend Weaver of Grass has suggested this meme so here is my contribution. So many people are inspirational, my family, my fellow bloggers, artists, craftsmen, writers, musicians, not to mention places, nature, etc. I had great difficulty in concentrating on one theme but in the end I narrowed it down to the work of one man, Robin Tanner 1904-1988. Ever since I first learnt about Robin Tanner and saw his work, I have been drawn back again and again into his quiet, intense and artistic world, he is a constant source of inspiration to me. An artist driven by a deep appreciation of nature who had a complete disregard of commerce. 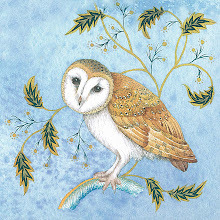 Robin was an educator and an expert illustrator and etcher; inspired by the natural world he created work of such exquisite beauty that they can move me to tears. 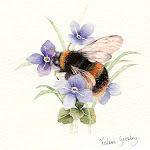 He in turn was inspired by other inspirational artists notably Samuel Palmer and William Morris. His etchings started as drawings, closely observed from nature. Every tiny centimeter of the surface was covered by the tiniest of details, giving the final work great intensity and magic, he had the ability to contain a whole world in a few inches, often viewed from a mouse’s perspective. 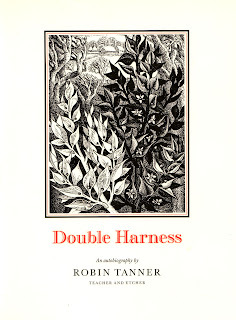 I managed to find a copy of his autobiography, “Double Harness” which I can wholeheartedly recommend; it is both an excellent read and is illustrated with many of his extraordinary inspirational, lyrical works. 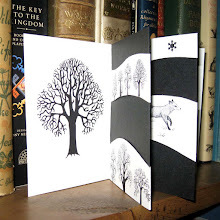 All together now---"Oh, the weather outside is frightful, but inside it's so delightful, and we really don't even mind, because today we're going to bookbind". 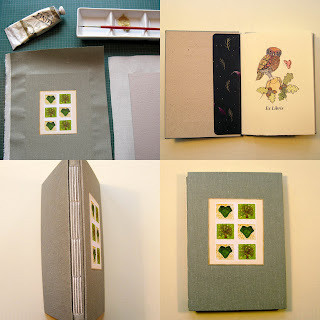 The rain has put a stop to any plans we might have had to get our garden in order so I have been doing a spot of bookbinding. I bought some lovely old sage grey/green book cloth ages ago and it has been sitting looking at me from the corner of my room waiting for a bookbinding day. I wasn't quite sure what I would do with it, somehow it just took shape. 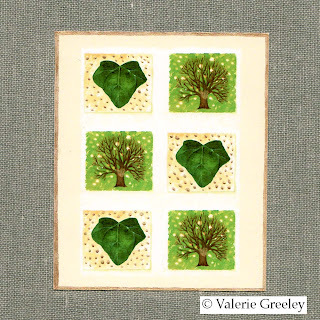 I had some pre-cut pieces of board which I covered and backed with Khadi paper. I lined a third piece of cloth with a black, handmade paper which has little pink petals in the fibers, this piece formed the spine. 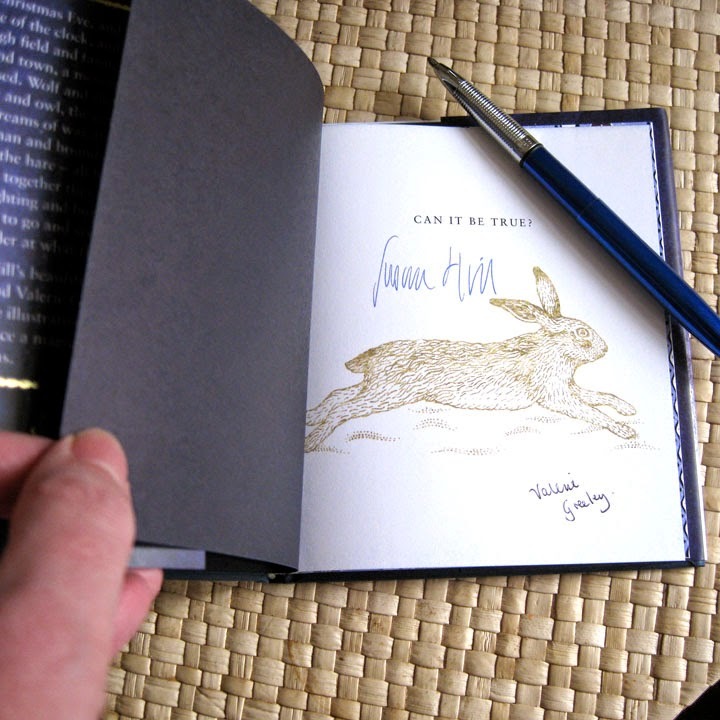 I cut and folded the signatures to make a four sections which I sewed onto the spine with linen thread. 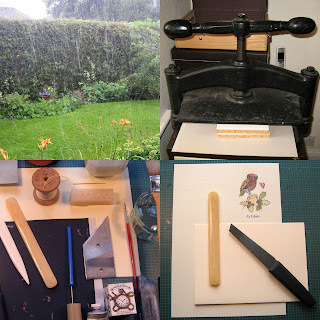 I love all the paraphernalia associated with bookbinding and have been slowly gathering bits and pieces of equipment over the years. Needles, linen thread, beeswax, bone folders, I simple cannot resist buying them when I get the chance as you can see if you click on the photographs. You can see the finished book here. The moon and our little star! As you might have gathered by now, I have a bit of an obsession with the moon. I think that there is no more magical a sight than a full moon in a clear sky. The first time I ever looked at the moon through an ordinary pair of binoculars I was astounded at how very round it appeared! I love the way the moon appears to change its shape, sometimes a crescent, sometimes a half circle then a full circle. It has such a mystery and a majestic quality about it, the fact that a day on the moon lasts about two weeks, the fact that it has a dark side which we will never see, the way it influences the tides and possibly behavior, all add to its poetry and mystique. I have been enjoying all the wonderful television and radio programs dedicated to the moon and in particular the moon landings. I am sure those of you who grew up in the sixties will have vivid memories of watching the moon landings on television. When I was little I used to visit a very old lady in her late nineties, she was appalled at the idea that men would land on the moon. She said that the moon was put there by God to light the way for lovers and it was folly to send space ships and rockets there. In the days before street lights a clear moonlight night afforded extra opportunities for “walking out” as she called it. She had memories of soldiers who were sent oversees to fight and who found solace in the fact that the moon that they could see was the same moon that their sweethearts could see at home. When our children were little they loved to look at the moon, I think that was also one of the first words they said. “I see the moon, the moon sees me” was a favourite rhyme in our house and was the inspiration behind “White is the moon”. When our eldest son first learnt to talk he would say things like “look moon, see my kickerballer boots” I am not sure what the moon replied! When I first started this blog I decided not to make it too personal and so I try to resist the temptation of posting family photo’s, however I am sure you will understand that some events are just too exciting not to mention. 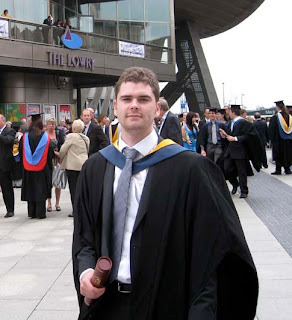 We joined the ranks of proud parents this week as we went to our youngest son’s graduation ceremony. Here is our “Sweet Baby James” all grown up and looking very smart in his new suit. Great excitement today, I just learnt that a product that I designed for my newly created Zazzle shop has been featured for a TBA award. This means that it will be featured as one of "Todays Best". 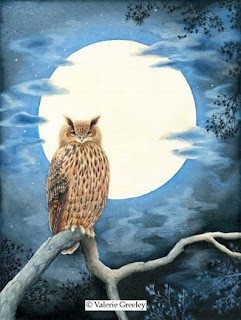 In case your wondering, the owl image was put onto an organic tee shirt, you can follow the link in the side bar for a close up, I cannot fathom out how to post the image of the product from the site without using the flash panel. How many hours do we use up trying to keep up with the cyberworld? emails, websites, blogs, twitters, whatever next? July in my garden always induces a mild panic attack, especially when the weather is rainy and warm. These conditions make everything grow twice as fast as they should or so it seems. I try very hard to keep on top of things but somehow nature overwhelms me and all I can see are jobs to do, ivy to trim, weeds to deal with, roses to dead head, the list goes on. We have had quite a few people to stay recently and they see things through very different eyes, most of them see a small but beautiful garden and are oblivious to the effort it takes to keep it at least halfway under control. 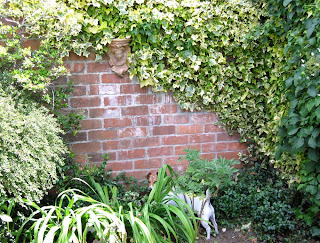 I am now trying to enjoy my garden a little bit more and to let the weeds and black spot and overgrown hedges etc. etc., matter less! The rose is one of my David Austin roses, which seem to thrive despite my neglect. I love their old fashioned, cabbage like appearance and wonderful smell. 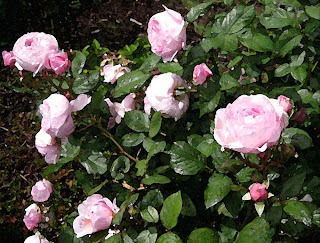 This one is named after the gardener “Geoff Hamilton”. The image is a photograph which has had filters applied to make it look like a painting. If you click on it you will see it in more detail.I think that it still looks like a photograph but the filter has softened it a little. Does it look like a photograph to you? 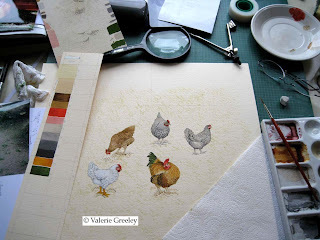 I started this new collection of farm animal designs for Makower ages ago, well about ten months to be precise. 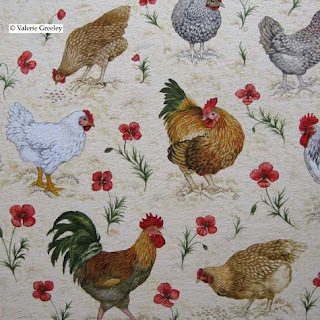 The collection includes chickens, sheep, cows and pigs and an assortment of flowers such as poppies and buttercups. (definitely no giant hogweed!) 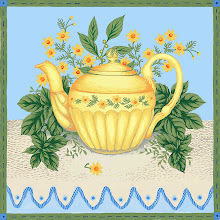 I am told that this particular fabric design pictured here on my desk, has now been printed so I guess it is safe to show you. The first photo shows the design in its early stages, that is the creative, fun part. Next comes the more challenging part, that of working out the repeat. The artwork also has to translate into eighteen colours, that may sound like a lot but they soon get used up trying to achieve shaded effects, for example, a leaf with four shades of green counts as four colours. 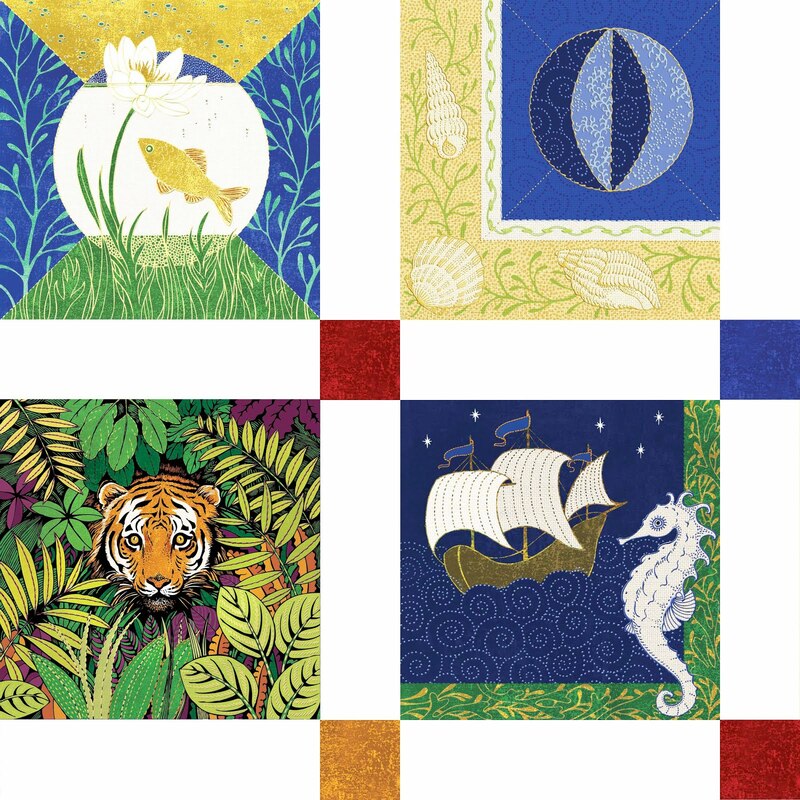 I am really looking forward to seeing what people do with the fabric, maybe I will even see some of it made up into a quilt on someone's blog one day soon!